The Trans-Pacific Partnership (TPP) and Transatlantic Trade and Investment Partnership are regional trade deals that could have adverse trade and growth effects on excluded poor countries. US trade policy already discriminates against exports from poor Asian countries; the TPP would make things worse, for example, by giving preference to Vietnam’s exports over Cambodia’s. Regional agreements can also undermine the World Trade Organization and the global system that protects smaller, weaker developing countries. Strengthen the African Growth and Opportunity Act. Congress should strengthen AGOA by providing a long-term extension well before its 2015 expiration, expanding access for agricultural products, and working with the administration to implement innovative capacity-building mechanisms. Provide duty-free, quota-free market access. 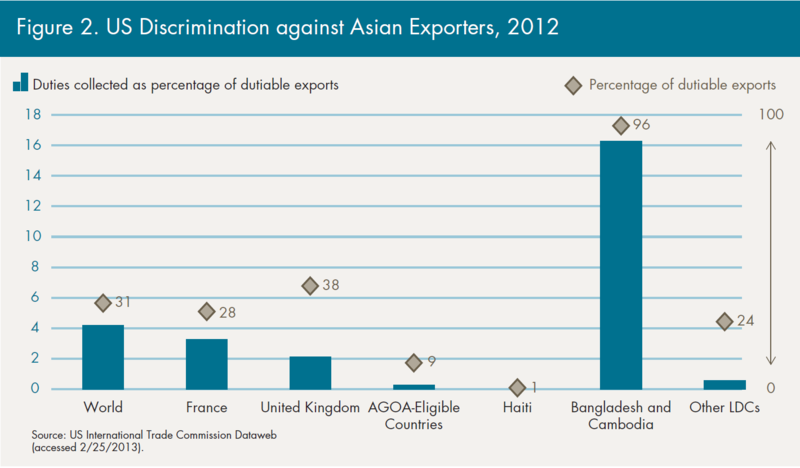 Congress should address US trade discrimination against poor Asian exporters by providing duty-free, quota-free market access for imports from all least developed countries. Declare a Doha Victory and Move On. The administration could then leverage this market opening to salvage something from the Doha Round at the WTO ministerial meeting in Bali in December. The stated priorities for US trade policy this year are completing the Trans-Pacific Partnership (TPP) and launching the Transatlantic Trade and Investment Partnership with the European Union. These regional trade deals will not necessarily be as problematic as their more outspoken critics contend, but they could make trade and growth even more difficult for excluded poor countries. US trade policy already discriminates against exports from poor Asian countries; the TPP could make things worse by, for example, giving preference to Vietnam’s exports over Cambodia’s. The proliferation of regional agreements also undermines the World Trade Organization (WTO) and the global rule-based trade system that particularly protects smaller, weaker developing countries. Taking these steps could also revitalize the WTO, which would benefit the US business community, as well as developing countries, and the gains would come at little or no cost to import-competing sectors because LDCs account for less than 1 percent of total US imports. AGOA, which passed Congress with bipartisan support in 2000, provides eligible countries with duty-free access for everything except sugar, dairy, peanuts, and a few other products. The program did less to diversify African exports than hoped, but it was not a total failure. 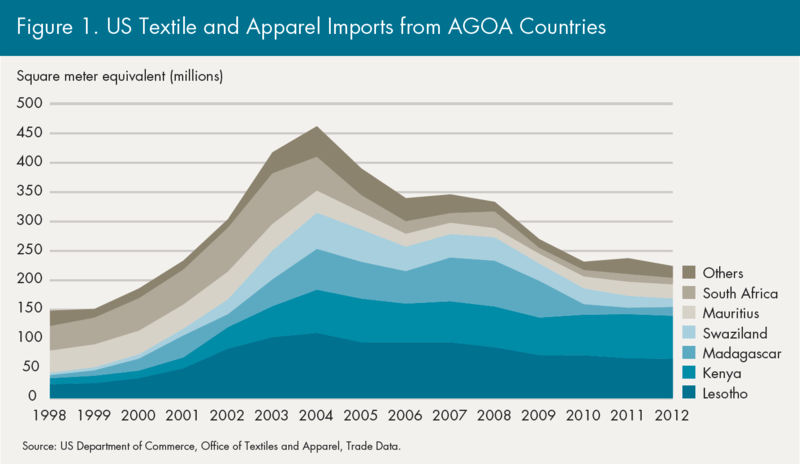 Petroleum still accounts for more than 90 percent of imports under AGOA, but, as shown in figure 1, clothing exports also increased sharply. Those exports declined when the managed trade system for textiles and apparel expired in 2005, and again when the financial crisis added an unexpected shock. Still, clothing exports in 2012 were 50 percent above where they were before Congress approved AGOA and up by multiples of that in Lesotho and Kenya, which are the principal beneficiaries. investors as well as foreign. The insurance could cover risks in areas such as customs clearance, licensing, and power supply that are not typically covered. By providing some assurance that reforms will be sustained, these proposals would help draw private investors to Africa while also reassuring donors that their aid dollars are being used effectively. And the average tariff on the remaining AGOA exports was well under 1 percent, while the average tariff on Asian LDC exports was 15 percent. To put it more starkly, the $450 million in duties collected on imports from Cambodia in 2012 were larger than those collected on imports from either France or the United Kingdom. See figure 2. Trade facilitation measures that reduce unnecessary red tape and build the capacity of customs and other trade-related agencies are in everyone’s interest—exporters and importers, rich and poor—and this issue is relatively uncontroversial. The major issue of concern in the Doha Round for the least developed countries is the DFQF initiative. The United States is the only major country that has not moved on it and failure to do so could well doom any chance for a positive outcome at the upcoming ministerial meeting in Bali. A package including trade facilitation, DFQF for LDCs, and perhaps a couple of minor agricultural trade issues would be a far cry from what was envisioned for the Doha Round a decade ago, but it could be enough for members to declare victory and begin the task of revitalizing the WTO. In sum, congressional approval of duty-free, quota-free market access for the least developed countries would open the door for the United States to “save” the Doha Round, and for everyone to move on to a 21st century agenda. Combined with measures that strengthen AGOA and expand its benefits, this package would be a success for the United States, for African and other poor countries, and for the global trading system as a whole. Most of the rest of the AGOA exports were petroleum products where the tariff is so low that some exporters do not bother to claim the benefit. The average tariff on other LDCs is low because they export mainly agricultural or other commodities that face low duties. www.g20.utoronto.ca/2012/2012-0619-loscabos.html, accessed January 24, 2013.